In addition to its print and online collections, Hewes Library is also home to unique and ever-changing art displays and exhibitions. Len G. Everett Galleries, located on the Upper Level, consist of two galleries, clearly visible from the stairs and the elevator. 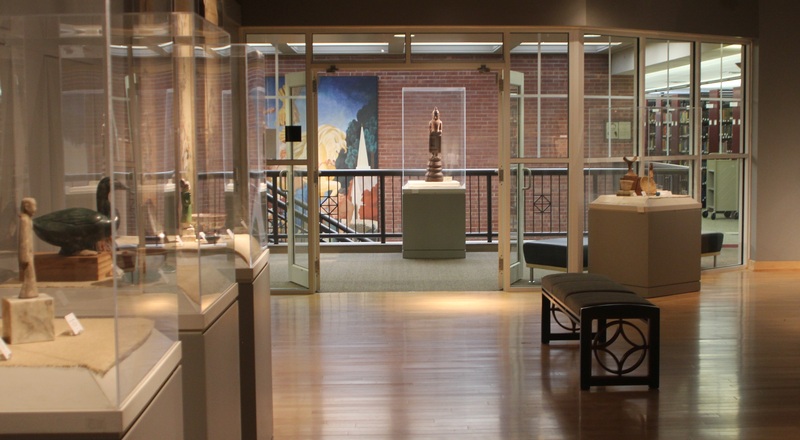 In Gallery 203, Monmouth College is the proud caretaker of a distinguished collection of art and antiquities. Our Permanent Collection includes bequests of works of antiquity from the personal collection of James Christie Shields (Class of 1949), traditional woodblock prints from Takashi Komatsu (Class of 1910), works of printmaking from the Carnegie Print Collection, contemporary Japanese prints and paintings from Dorothy and James Schramm, and artwork primarily of the Pacific from W. Stewart Riley (Class of 1945). Selected works from the Permanent Collection are put on display in Gallery 203 as well as in several display cases throughout Hewes Library. A selection of permanent items on display in Hewes Library can be viewed on Art and Architecture in Illinois Libraries website. Gallery 204 is the larger of the two galleries, making it an appropriate site for the parade of varied and far-ranging exhibitions that visit it throughout the academic year. It showcases not only student artwork, but also exhibitions of regional and national artists. 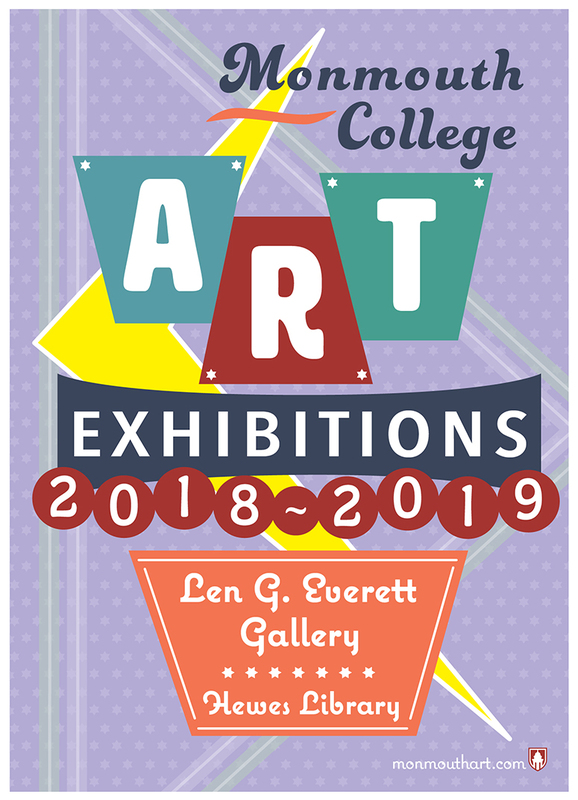 Inquiries regarding the galleries should be directed to the Monmouth College Art Department at 309-457-2108. Cultural Gems: A selection of treasures, mostly on a smaller scale, from various cultures from the many artifacts in the James Christie Shields Collection. Portraits European and American: A selection of portraits from both Europe and America from the James Shields Collection. From the personal notes of James Christie Shields, MC Class of 1949, from whose collection this work comes. Ushabti are Egyptian funerary figurines intended to act as servants or minions in the afterlife for the deceased. Oftentimes they were depicted as farm laborers with a hoe and bushel. Along with scarabs, these are the most common Egyptian artifacts found in collections. In ancient Egyptian religion, the sun god Ra is seen to roll across the sky each day, transforming bodies and souls. Beetles of the carabaeidae family (dung beetle) roll dung into a ball as food and as a brood chamber in which to lay eggs; this way, the larvae hatch and are immediately surrounded by food. For these reasons the scarab was seen as a symbol of this heavenly cycle and of the idea of rebirth or regeneration. The Egyptian god Khepri, Ra as the rising sun, was often depicted as a scarab beetle or as a scarab beetle-headed man. The ancient Egyptians believed that Khepri renewed the sun every day before rolling it above the horizon, then carried it through the other world after sunset, only to renew it, again, the next day. Scarabs are found in many Egyptian tombs, both royal and common.